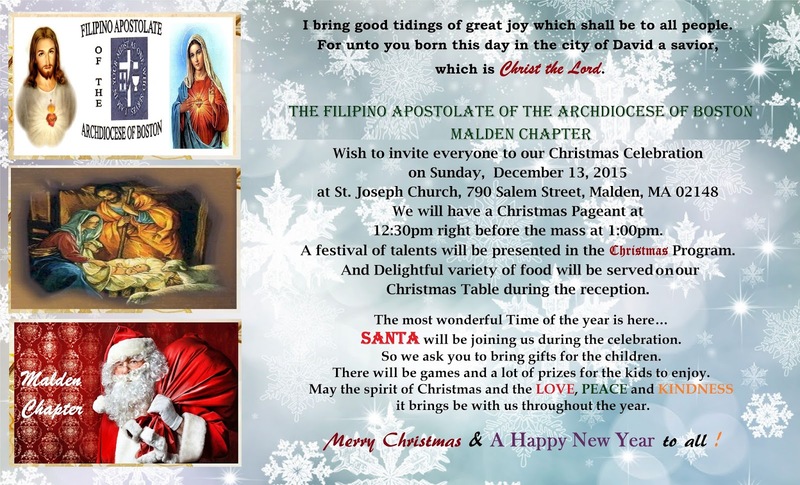 Malden Christmas Pegeant 2015 from Filipino Apostolate on Vimeo. JC Pagulong: Lord I Offer My Life For You from Filipino Apostolate on Vimeo. Aly from Filipino Apostolate on Vimeo. Dance Phlippines from Filipino Apostolate on Vimeo. 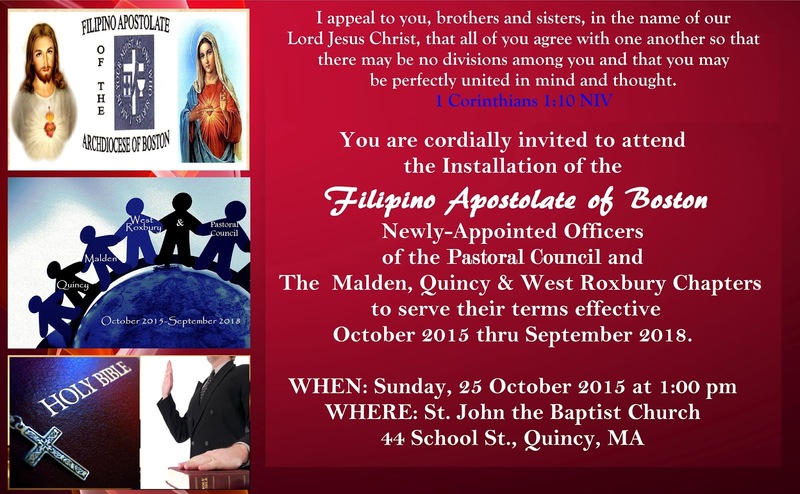 Quincy Youth Choral Group from Filipino Apostolate on Vimeo. Kundiman By: Romeo Malimban from Filipino Apostolate on Vimeo. Robyn Malimban from Filipino Apostolate on Vimeo. 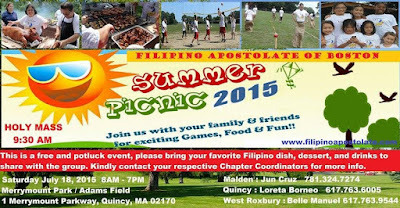 Malden Boys Dance Maglalatik from Filipino Apostolate on Vimeo. 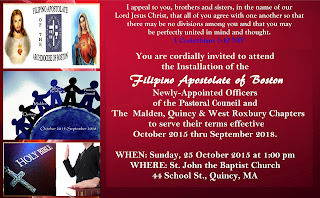 You are cordially invited to attend the Installation of the Filipino Apostolate of Boston Newly-Appointed Officers of the Pastoral Council and the 3 Chapters' (Malden, Quincy & West Roxbury) to serve their terms effective October 2015 thru September 2018. WHEN: Sunday October 25, 2015 1:00 PM. 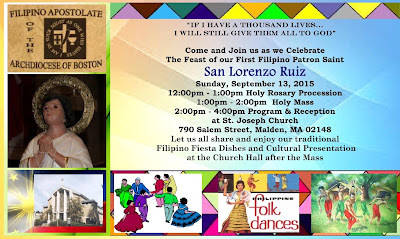 The Installation ceremony will be held during the Sunday Mass. Reception at the Basement Church to follow after the Mass. 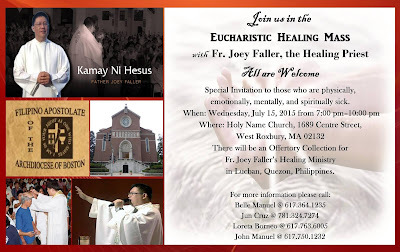 Special invitation to those who are physically, emotionally, mentally, and spiritually sick. 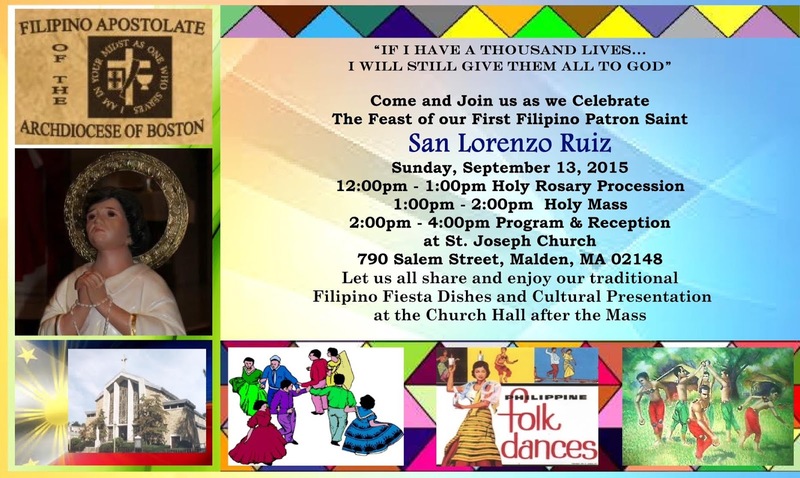 There will be an Offertory collection for Fr. 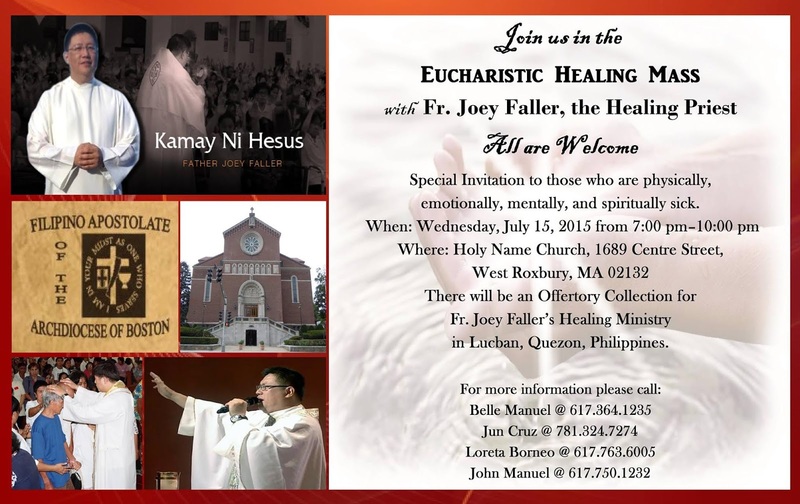 Joey Faller's Healing Ministry in Lucban, Quezon, Philippines. 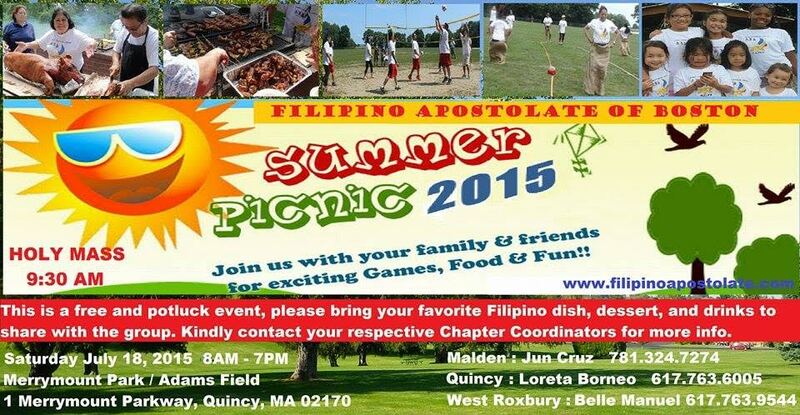 The Filipino Apostolate Annual Picnic will be July 18, 2015 at Merrmount Park in Quincy. Holy Mass will start at 9:30. Fun and games to be had by all. This is a potluck event so please bring your favorite dishes to share! Contact your chapter coordinator for more information. June 20, 2015 4:00 pm. (3). There will also be shuttle buses for all those who choose to come by subway on the Orange line at Roxbury Crossing. 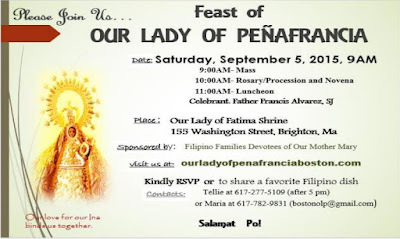 Quincy's 4th Sunday Mass for the month of May is CANCELLED instead we invite our FA Parishioners to attend the Santacruzan & May Flower festival at the La Salette Shrine in Attleboro, MA on Sunday, 5/24, starts at 10:30am (Rosary procession, Mass & Reception) thru 4pm. 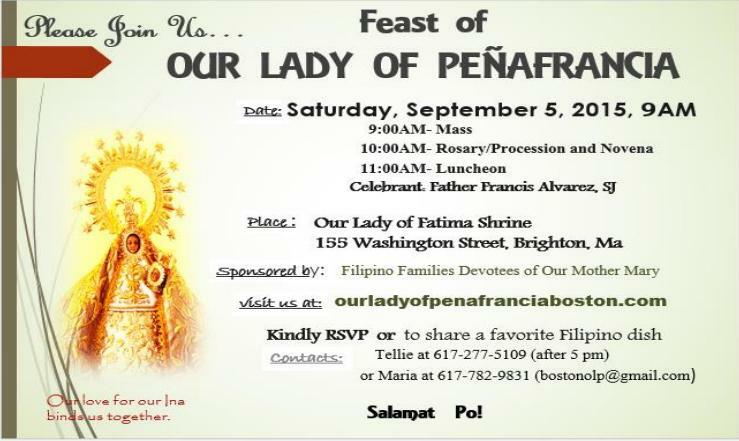 What : Please join us to honor our Blessed Virgin Mary, in our traditional Mayflower Offering and Crowning. When: May 10th, second Sunday, 12:30 pm, assembly 12:15. 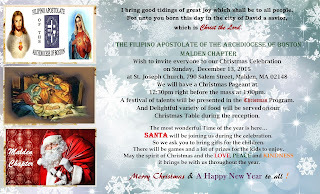 Where: St. Joseph Church, 790 Salem St., Malden, Ma. Who: Everyone is invited. Bring the whole family. Details: We will assemble at 12:15 outside the Church - please form two lines behind the Altarservers bearing the Cross. The Holy Rosary will be recited and Marian Hymns will be sung during the procession around the church. As we enter the church, flowers will be distributed to each participant. Everyone will be able to offer flowers to Our Lady and a little child will crown Our Lady towards the end. Attire: Men can wear their barongs. Ladies and children - their Easter best, first communicants can wear their Communion clothes and veils. Holy Mass will follow at 1 pm. We also invite you to our potluck lunch at Church Hall after Mass. CONGRATULATIONS to the 2015 RECIPIENTS of the Archdiocese of Boston's Office for Lifelong Faith Formation and Parish Support. Congratulations to the following individuals who were nominated and will receive the Recognitions Award from the Office for Lifelong Faith Formation and Parish Support of the Archdiocese of Boston. 1. PATRICIA CANDEDO SOMERA – "St. Dominic Savio Award"
The "St. Dominic Savio Award", an Archdiocesan Award is presented to a middle school youth who is a witness to their faith in the Lord Jesus by their commitment to serving the needs of their parish and/or school. Following the example of St. Dominic Savio, these young people live lives formed by Christian values and stand out among their peers as leaders. Dom Savio, a student of St. Don Bosco was a very reverent and prayerful youth. His life was dedicated to doing small things for the glory of God: "I can't do big things, but I want everything to be for the glory of God." The Discipleship Award is a Parish/School award presented to youth who respond to the call to discipleship through their witness. These young people minister to the needs of others bringing Christ's message of discipleship to all. The Light of the World is a National Federation of Catholic Youth Ministers (NFCYM) award presented to express appreciation and gratitude to adults who have demonstrated a commitment to young people and youth ministry as reflected in "Renewing the Vision". The award presentation will take place at the Faith Formation of Youth and Young Adults (FFYYA) Awards Banquet to be held on April 29, 2015 at Lombardo's in Randolph. Knowing that family and friends may want to celebrate this special event with our awardees, please contact the awardee or parents for the Awards Banquet Reservation. Please be reminded that the Banquet is not a free event. We honor and recognize our Awardees and celebrate the great things God is doing in and through the youth and young adults of the Filipino Apostolate community and the Archdiocese of Boston, and to those who serve them. Again, thank you and CONGRATULATIONS to the FFYYA Awardees. God bless you always!